Ottawa Valley Dog Whisperer : DO YOU HAVE A TOUGH TIME CUTTING YOUR DOG’S NAILS? DO YOU HAVE A TOUGH TIME CUTTING YOUR DOG’S NAILS? Dogs, like people really do not like being handled, groomed and having their nails cut by someone who lacks confidence in what they are doing. After all, would you want a dentist to work on your teeth if they lacked confidence in what they were doing? Some of my clients tell me that they cannot cut their dogs nails and that their dog will go hide, struggle, bite - any thing to avoid having their nails cut. The same dog may also dislike being brushed and not allow their ears or teeth to be cleaned. Well, when I hear this, the first thing I say is ‘well, we are going to be changing that today’. I then ask them to go get the nail clipper and brush. It is all in our attitude guys! Your dog knows if you are afraid of cutting his nails too short. He knows if you are anticipating an ‘argument/fight’ over grooming. When you anticipate an argument you get an argument. Why is that? Well, would you be anticipating an argument if you felt 100% confident that you could control the situation? No, you would be confident and move forward with out concern. So now do you see why your dog argues with you over grooming - because he can. 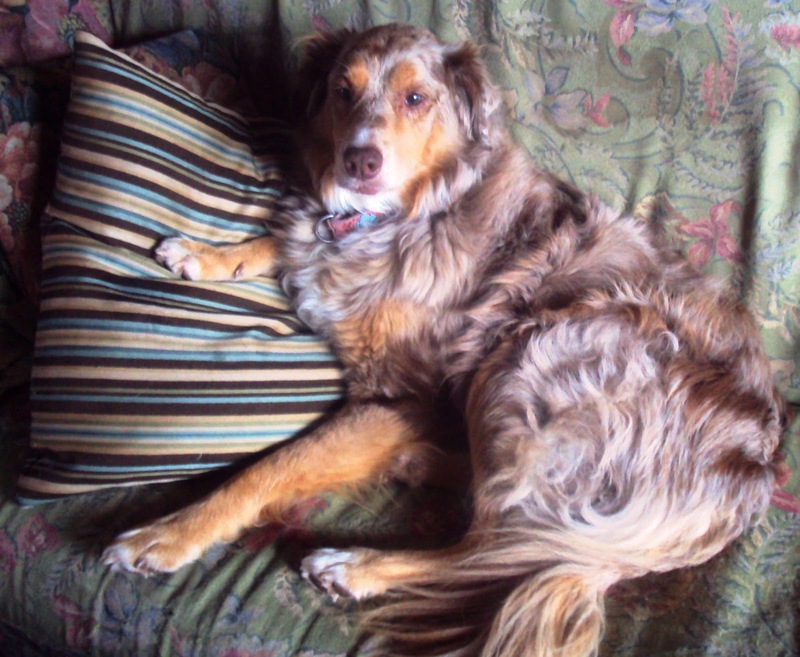 In addition, if you are frustrated, nervous or fearful you further erode your dog’s respect for you. Most dogs have a strong will and will persist to get their way, just as you would. If your will and commitment to succeed is not greater than your dog’s you will fail. If you are emotional you will fail. If you are insecure you will fail. When I go to clip the nails of a dog that is notorious for arguing with his people over clipping, I just proceed with confidence and never anticipate anything other than success. I don’t muscle my way in - I do touch respectfully and first get them accustomed to my touch, I firmly but respectfully disagree if they wriggle and then I clip or groom with respect, without fear, with confidence. For some dogs just my psychological; state is enough to win their confidence. and change in the dog's attitude is immediate. For other dogs patience and bringing them through the process in a phased approach is best. A phased approach for example could be a) getting the dog accustomed to having their paws and nails touched first, then b) clip one nail, c) give them a little massage or treat and then d) clip the next nail. This may take 10 or 15 minutes…but being patient once, allows the dog to go through entire experience and realize that they are not going to be hurt and that they are also not going to avoid. Depending on the dog, I may place them on their side and rest one arm on their side to calm them and confirm to them that they are to stay still. For other dogs this is not necessary. This same methodology can also be used to clean their teeth and ears as well as brush them. Once brought through the experience in a positive way the dog will change its association of grooming with from negative to positive and comfortable. You can trim my nails now - its OK, I trust you! A dogs nails consist of an outer shell which is comprised of dead cells (like our finger nails). The outer shell (a hard material) protects the soft tissue - the blood supply, called the kwick. If your dog has light coloured nails you can usually see the quick through the nail shell. This makes it easy to see where you need to cut the dogs nail…just below the kwick. 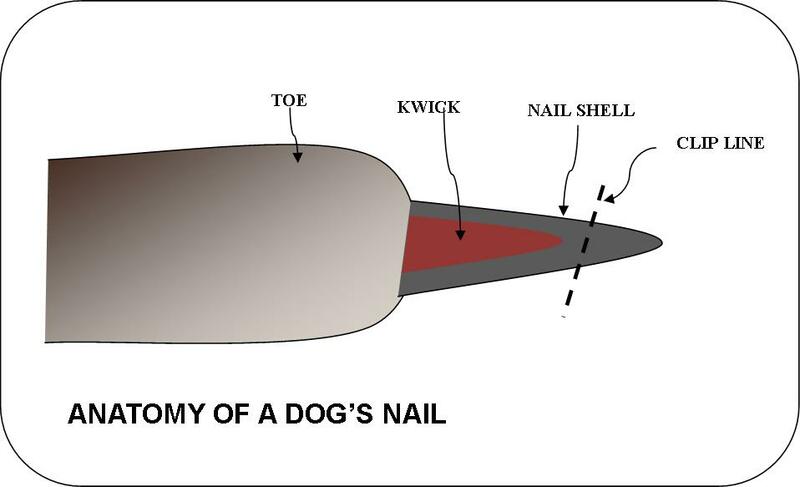 If your dog has dark colour nails and you are uncertain as to where to clip the nail…look underneath the nail. You will see that the nail looks solid (completely filled in) from underneath - up to a point. After that the nail appears hollow - all you see is the nail shell - no fill (no kwick). By taking a look at the nail from underneath you can see where to cut. Until you have more confidence cutting your dogs nails, just clip a little off the end. Once you gain confidence you can clip a little more of the shell. What tools do you need to clip your dogs nails? For very small dogs you can use a pair of dog nail scissor. For larger dogs you need to use a dog nail clipper. Some people also file or use a hand or motorized file (i.e. a Dremel tool ) to grind their dogs nails down. I have ten dogs and I use the nail scissor for my little guys and for the bigger dogs I use a dog nail clipper. If you like, you can purchase a styptik powder - one such product is called 'Kwick Stop'. Styptick powders are available at most pet supply stores. Styptick powder is used to stop the bleeding that occurs if you happen to cut into the kwick of your dog's nail. If you do not have styptik powder you can use cornstarch or cayenne pepper (make sure your dog does not lick the pepper). Juts dab the substance you are using onto the end of a slightly moist swab and apply to the end of your dogs nail. The powder stops the bleeding. In all of the years I have worked with dogs, I have only cut into a dogs kwick on one occasion. This to say that if you follow the instructions above the chance of cutting to close is greatly reduced. The biggest impediment to getting the job done is your own trepidation, once you allow yourself to relax and have confidence; nail clipping becomes a simple and routine task. Clipping the entire packs nails takes about 5 minutes. Investing time up-front, patience, persistence and employing the right state-of-mind will allow you to rapidly reach a time when nail clipping is a breeze...and your dog won't go to hide when those clippers come out! Five, be prepared for some push back, but don’t let it phase you…if your dog has gotten away with getting away, protesting and avoiding you need to understand that you must have patience. We don’t change our reaction and habit in split seconds - neither will your dog. Lead by example and your dog will change its view of the situation. Six, don’t argue with your dog - just direct and perform grooming from a calm, confident state of being. Seven, you can finish the process by being gently proud of your dog and yourself! Unbiased Diet, Nutrition, Product Advice - information and payment here >>. Holistic Diet, Nutrition Wellness Plans - information and payment here >>. In-Person sessions - information and payment here >>. On-Line consultation and sessions - information and payment here >>.